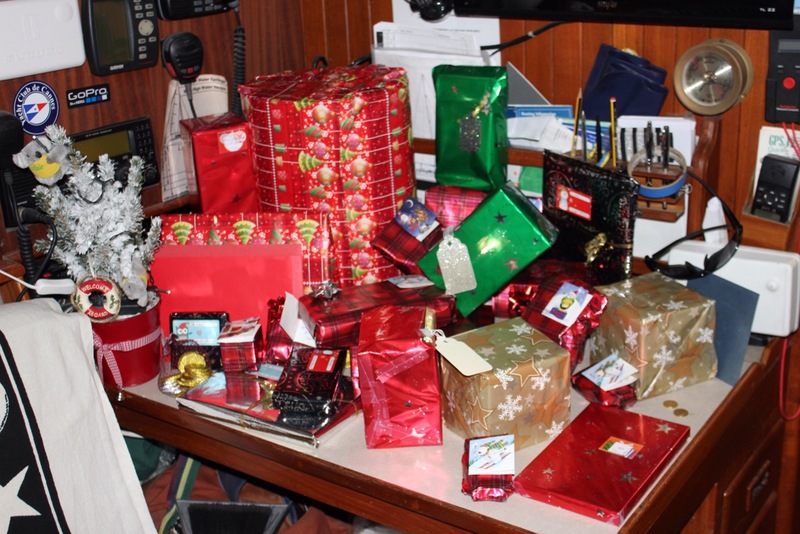 Ever wonder what it’s like spending Christmas on a boat? 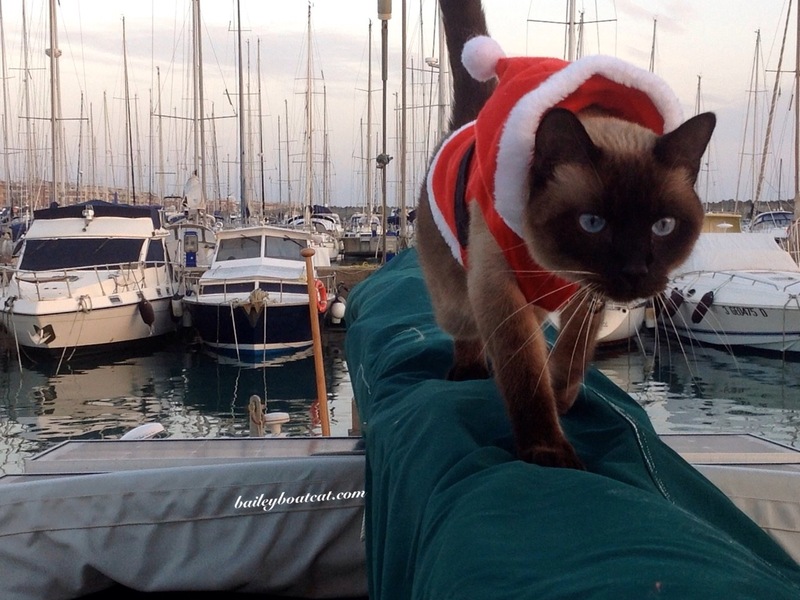 Our guest blogger Louise of Sandy Toes and Writer Woes shares some memories of pasts Christmas spent onboard with her cat Bailey, “author” of Bailey Boat Cat and gives some tips on how to decorate, cook and spend the holidays with fellow sailors. Christmas on a boat can be magical. If you’re prepared to use a little bit of imagination and a spark of creativity you can have a Christmas that you and your loved ones will never forget. 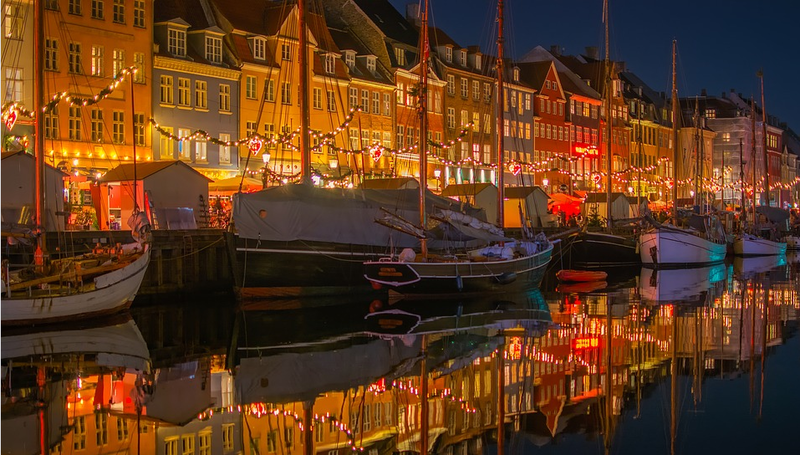 If you’ve never spent Christmas afloat before it might seem unusual, but after several years of floating festivities, I now miss the boat if I’m not there for Christmas. 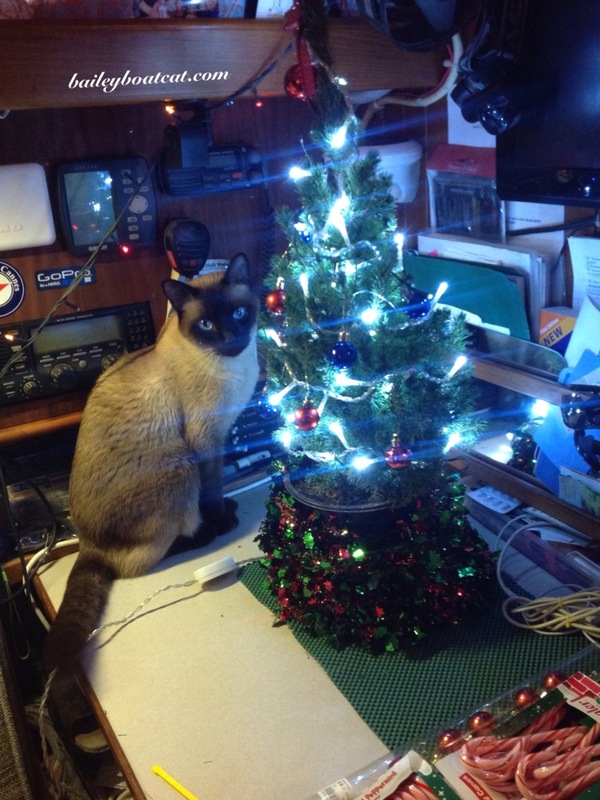 There are lots of ways you can make the boat feel festive. The cozy space below deck means that even with just a few decorations the cabin will be full of joy! You can decorate the compression post to make a Christmas ‘tree’. 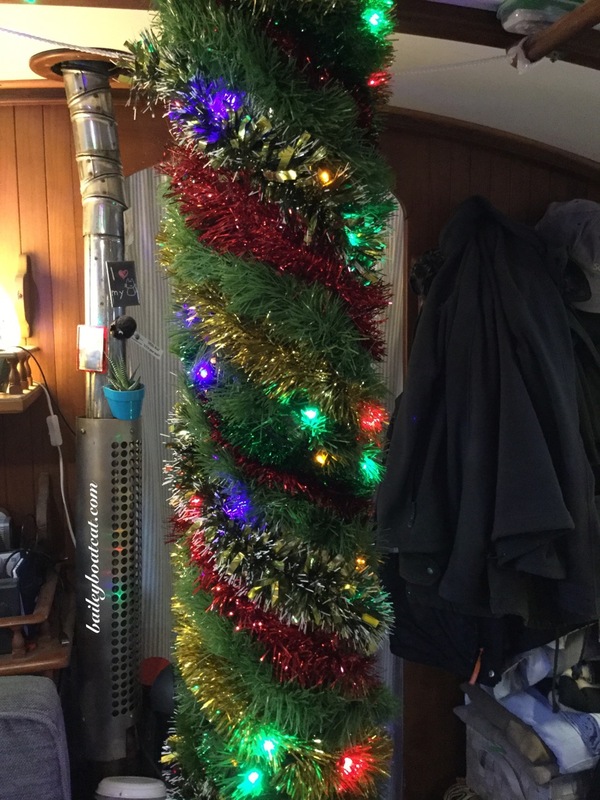 I usually use tinsel and Christmas lights and everyone that comes aboard loves the effect. If you’re in a marina or somewhere stable, you could also perhaps find a small Christmas tree. For me, although slightly more work in terms of cleaning up the pine needles, you can’t beat a real Christmas tree. The smell and feel of them add something very special to the Christmas vibe in the boat. Add a few small snowmen or reindeers and you’ve created a winter wonderland in three easy steps! You can also decorate the exterior of the boat by attaching a Christmas wreath to the bow. Some people even put outdoor lights around the cockpit, lifelines, shrouds or up the mast. One of the most exciting parts of Christmas afloat is that you can be inventive with your food for Christmas dinner. If you’re set in your ways and really want to enjoy a traditional roast dinner that you’ve enjoyed every year since your childhood, there will be a way for you to juggle the dishes to be able to make a wonderful roast in your small galley. If, however, like our crew you’re not overly concerned with tradition as long as you have a fantastic meal, you could adapt your Christmas dinner to a more boat friendly (read simpler) meal. One year we enjoyed steak, roast potatoes and a few roast vegetables and it was perfect washed down with a few glasses of wine of course! Christmas afloat will undoubtedly involve your neighbours at some point over the festive period. Sailors rarely need an excuse to celebrate with an alcoholic beverage after sharing and helping each other out. I’ve never experienced such warmth and camaraderie from any of my landlubber friends. Sailors truly know how to party! So if you’re considering spending Christmas afloat this year, I wish you calm seas and following glasses of wine! Louise is the author of two successful blogs, Sandy Toes and Writer Woes as well as Bailey Boat Cat. You can read more of Louise’s adventures on sea and her sailing tips on our magazine. 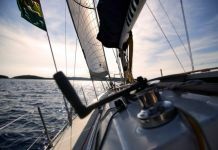 If you’re planning a winter escape, check out our post on the best winter sailing destinations to help inspire your next sailing holiday with Zizoo.